Oversized breakers will allow wires to overheat without the breaker tripping. Outlets used for heat-generating appliances like kettles, hairdryers and electric heaters, are the most likely to overheat. 1920 – 1950: These houses probably have knob-and-tube wiring. Obsolete ceramic fuse panels, switches and fixtures may be present. Exterior wiring should far enough from roof decks so that people cannot touch the wires. A home inspector needs to inspect the service box, service grounding, the inside of all distribution panels, the wires of the home, fuses and breakers. Most household branch circuits in pre-1960 houses have no ground wire. This Electrical Course starts with a description of house electricity and develops an understanding of the basics. The Course moves on to address getting electricity into the house and distributing it safely to its end-use points including switches, lights and receptacles. The Course is designed to provide people who do not have an electrical background with the skills necessary to perform the electrical part of a professional home inspection. 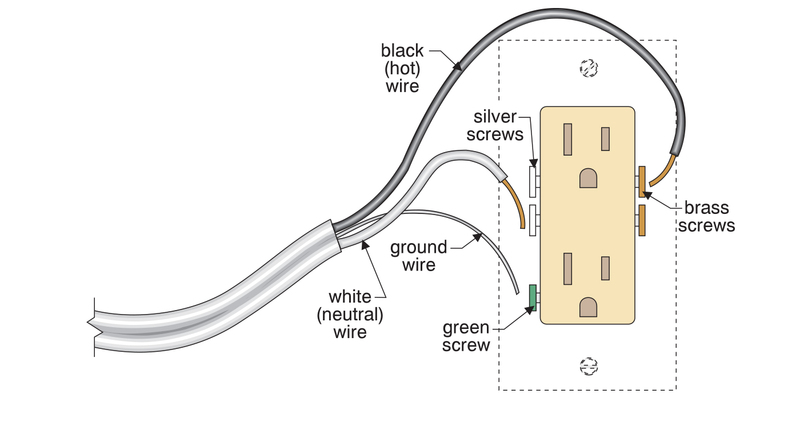 Electrical Course – Color coding for typical 120 volt circuit — This illustration shows how to properly wire a receptacle. It is from our Electrical Course, Basics of Electricity Chapter. All of our 10 Courses contain easy-to-understand illustrations that help you understand the subject.